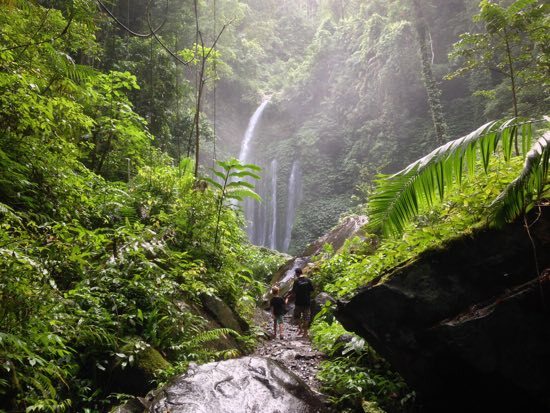 Photo: Waterfall hunting near Senaru. While many people see no more of Lombok than the glistening Gilis off the northwest of the mainland, the island has plenty more on offer including the opportunity to climb the second highest peak in Indonesia, surf on some of the best waves in the country or relax in a little-known paddy-set village. While you could skip through and touch upon the absolute highlights with a week or so, set aside four weeks and you'll enjoy far more of a rewarding and under-visited island. Here's how. Lombok is slightly smaller than Bali and is roughly round in shape. The western ferry terminal is at Lembar and has regular ferry connections to Bali (and Sumbawa's Bima, via Pelni's KM Kelimutu), while the eastern ferry port at Labuhan Lombok has connections to Poto Tano in Sumbawa. There are also regular fast boat services between the Gili Islands on the northwest coast of Lombok with Amed, Padang Bai and Sanur (via Nusa Lembongan) in Bali. Lombok's shiny new airport is at Praya in southern Lombok, about 20 minutes by car from Kuta and an hour from Senggigi. There is a network of good roads around the island to most population centres and you can explore much of the island without hitting a dirt road. Public transport is cramped and slow but cheap — it isn't really designed with tourists in mind but it is usable. If you're intent on exploring a lot of the islands, forking out the cash to hire a scooter or car will pay off in spades. Lombok shares the same monsoon climate as Bali, meaning the weather from roughly late October to late March involves quite a bit of rain, while April to September is mostly dry. If you're planning on climbing Gunung Rinjani, keep in mind the peak is closed from late December to the start of April, though the exact dates change each year depending on the weather. Surfing season on the south coast is November to March, while Bangko Bangko is in season from May to October. Taken in the middle of rainy season, Gili Ringgit. Lombok is cheaper than Bali, but not as cheap as you may expect. We struggled to find options below 100,000 rupiah a night with rates between 250,000 and 400,000 being far more easy to find. Dorms outside of Senggigi, the Gilis and Kuta were non-existent. Food prices, especially in guesthouses and foreigner-orientated restaurants, were surprisingly high. Alcohol is widely available, though not everywhere sells it — the only place we didn't see it on a menu or on display was in Labuhan Pandan on the east coast. Outside of tourist centres, ATMs remain rare. There are no ATMs between Tanjung (north of Bangsal for the Gilis) and Labuhan Lombok, way over on the east coast. Likewise the closest ATM to Tetebatu is at Masbajik and there are no ATMs on the Ekas peninsula. The closest ATM to Gili Gede is at Lembar. Plan your money carefully, especially while travelling the north coast. Let your hair down on Gili Meno. 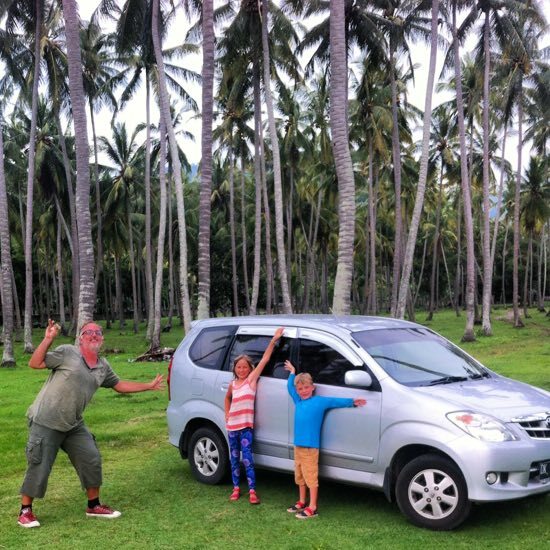 The following four-week itinerary for Lombok starts and finishes in Lembar, working on the assumption that you're arriving on a slow ferry from Bali. It is circular though, so it is easy to adapt this if you're flying into Praya or taking a fast boat to the Gilis. The itinerary is also based on you having your own transport, but all the following is also possible by either public transport or taxi. 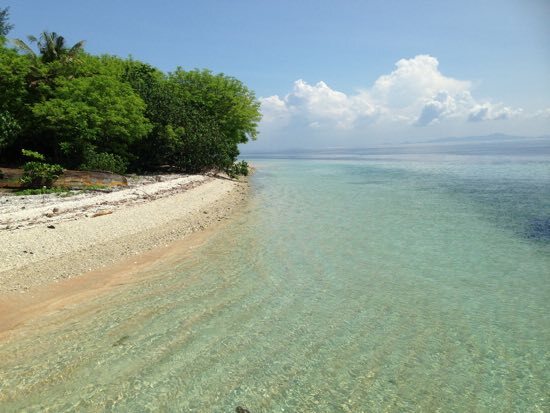 Gili Gede is a little touristed island on the north coast of the Sekotong peninsula. It hosts a handful of places to stay and you can do snorkelling trips to nearby islands where there is some good snorkelling on offer. 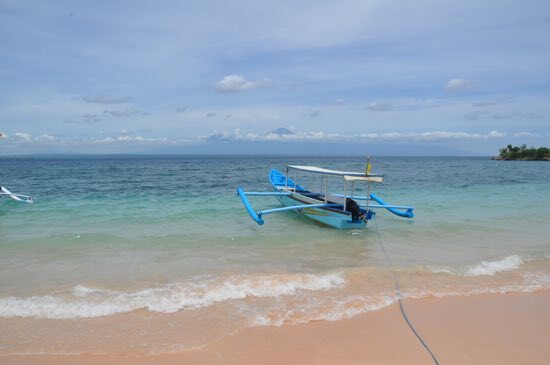 Catch a morning boat from Padang Bai in Bali for a midday arrival in Lembar. From Lembar either drive or ride yourself to Tembawong (the boat landing for the island) or catch a taxi from Lembar (200,000-250,000 rupiah) or bemo (30,000 rupiah). If you're aiming for a bemo, you'll need to hike out of the port area for about a kilometre to the main road as they are not allowed into the immediate port area. The trip to Tembawong should take one to two hours. There is parking by the boat landing and the boat trip takes 15 to 30 minutes depending on where you are staying on the island. If you're looking for something more upmarket, consider Pearl Beach Resort on Gili Asahan. 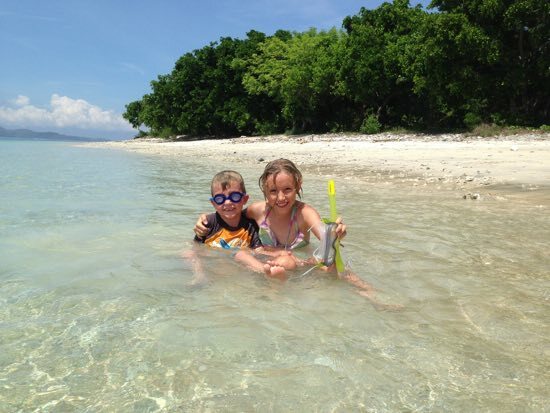 Castaway your kids on Gili Layan. Spend one day walking around the island and another day doing a snorkelling trip to nearby Gili Ringgit and Gili Layan. Don't bother snorkelling off Gili Gede as it is much better on Layan and Ringgit. 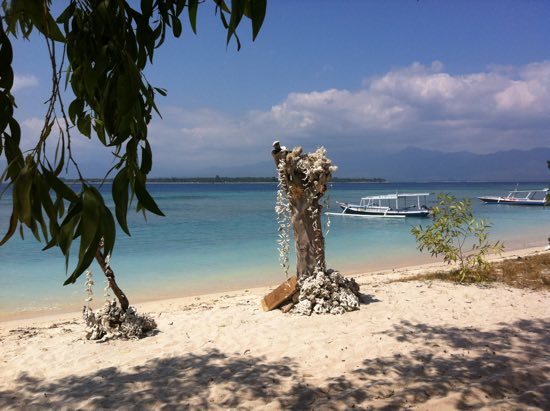 All guesthouses on Gili Gede can arrange a snorkelling trip. You mean we have to swim here? Leave Gili Gede after breakfast and head to Mekaki Beach on the south coast of the same peninsula. It is an outstanding beach and the road is great. Either drive yourself or hire an ojek in Pelangan (the junction town near Tembawong) for the return trip — it is worth it. Once you're suitably sandy retrace your steps to Lembar and then north to Senggigi. Senggigi was once Lombok's premier beach resort, but its star is fading and with just four weeks we'd say you're better spending your time elsewhere on Lombok. Enjoy the surrounding beaches, explore the markets, grab some barbecue corn and satay on a headland one sunset and perhaps head to one of the fancy resorts on Mangsit for sundowners. The town is also close enough to Mataram to allow for a day visit down there if you are interested. One thing in its favour: Senggigi does have a fair supply of budget accommodation. People happily spend four weeks on just the Gili Islands, so these three islands are an easy way to blow a timeline. We're allowing two days on each but feel free to adjust that. Each island has its own distinct character. At risk of stereotyping, Gili Trawangan is the party island for young people with less money, Gili Meno is the family island and Gili Air is the party island for older people with more money. They're easily reached from one another, so it is easy to chop and change between islands. Drugs, especially pot and magic mushrooms, are freely available on all three islands. Be aware of penalties for illegal drug use and possession in Indonesia — and don't bring anything back to Lombok proper with you. The Gilis are also notorious for fake liquor - treat "cheap cocktails" with extreme caution, or better still, stick to beer. An early morning wander on Gili Air. Once you've got the Gilis out of your system, the Sire peninsula is just a hop, skip and a jump to the north and offers a sleepy getaway from the more hectic islands. 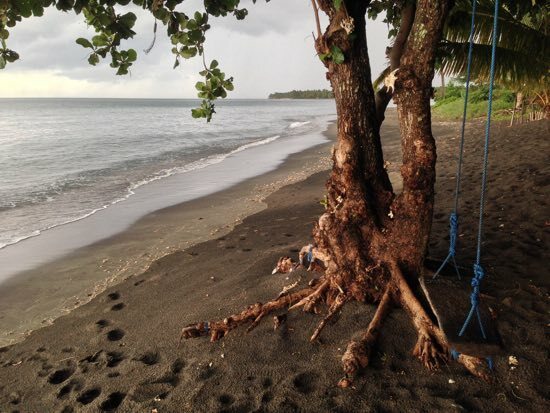 Walk the beach, visit nearby waterfalls or just chill out. Backpackers and flashpackers should head to Rinjani Eco Resort, while those with more of a budget will enjoy the Oberoi or Tugu Lombok. Take a swing on Sire. Senaru is the most popular spot for climbing Gunung Rinjani, but it is a terrific destination in its own right, with impressive waterfalls, excellent ridge and rice field walks and tremendous scenery. There's a solid range of accommodation from rustic through to flash and this is the best place to shop around for a Rinjani trek operator. While the crater rim is a popular option, if you're going to climb Rinjani, why settle for a half measures? Go for the four-day, three-night option which will see you transit to Sembalun Lawang so commence climbing, summitting the peak (thus doing the hardest bit first) then continuing along the crater rim, camping by hot springs and the lake and returning to Senaru. Assuming you're still able to walk, bail out of Senaru and haul around the northeast coast of Lombok to Labuhan Pandan and set up base at Pondok Siola. 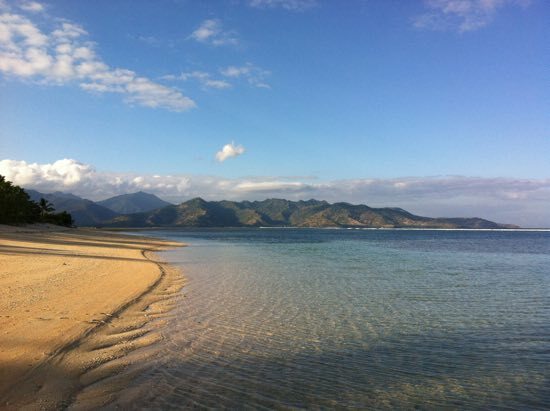 Set aside one day for a snorkelling trip to Gili Kondo and Gili Badari and day two for Gili Lawang and Gili Sulat. Snorkelling school near Gili Kondo. Peel yourself off the beach to head to Tetebatu on the southern slopes of Gunung Rinjani. 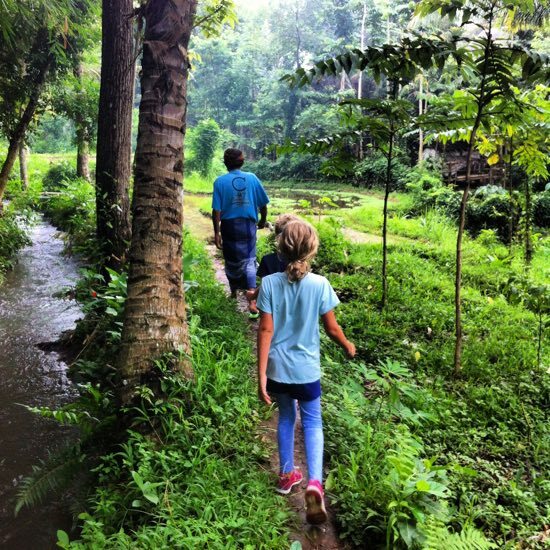 Spend a day doing a ricefield walk, visiting Sasak villages, fruit orchards and waterfalls. Spy some black monkeys if you're lucky (we only found a monkey skull). If you're doing this by public transport you'll need to get an ojek from Labuhan Pandan to Labuhan Lombok (20,000) then a bus heading to Mataram. Hop off at Masbajik and hire another ojek or a bemo for the run up to Tetebatu. These connections may take some time. Take a walk in the fields. 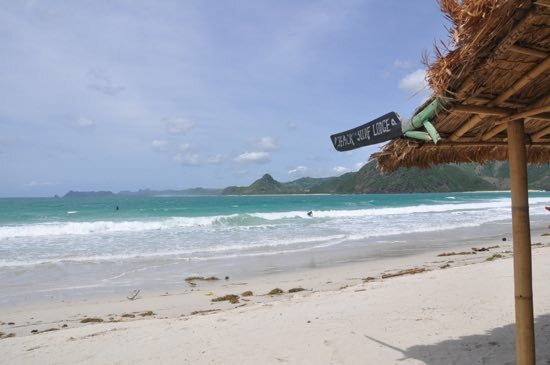 Head from one extreme to the other by heading down to remote Lombok at its best. Ekas is a small fishing village on the western coast of this stunning, rugged spur off of southeast Lombok. Expect beautiful beaches, outstanding surfing and a truly unadulterated feel. You will need your own transport to get around down here. Pink beach with a volcano chaser. You need a 31-day month to really cram all this in. 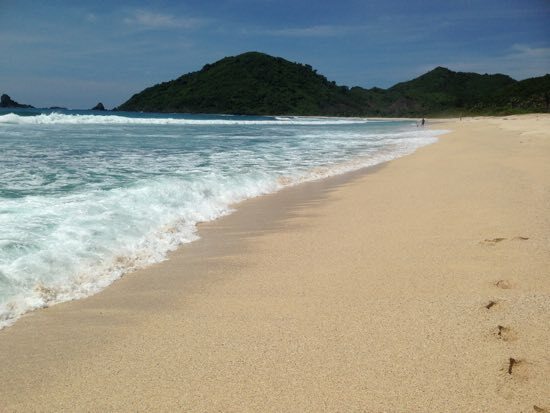 From Ekas, head west to Kuta Lombok where you're going to base yourself for the last two days. Do some surfing, explore some of the surrounding beaches, or just put your feet up and enjoy a couple of cold drinks — Kuta is good for all these things. When you're all done, it is a 20-minute barrel up the road to the airport and you're all done. Selong Blanak. Yes, it is worth the ride to reach. 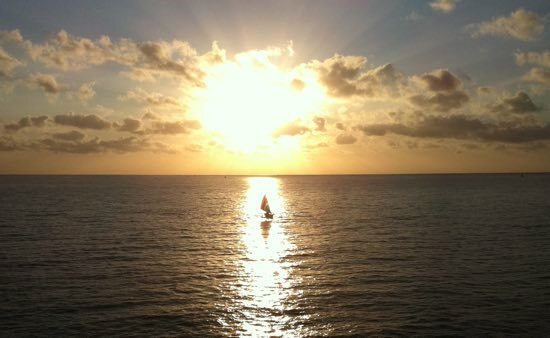 The above is a jam-packed itinerary and could easily do with another week or so to allow travel at a more sedate pace. If you have less time and need to drop something, skip Senggigi. If you don't surf, drop Ekas and Kuta. If you do surf but are not into volcanoes, drop Tetebatu and Rinjani. 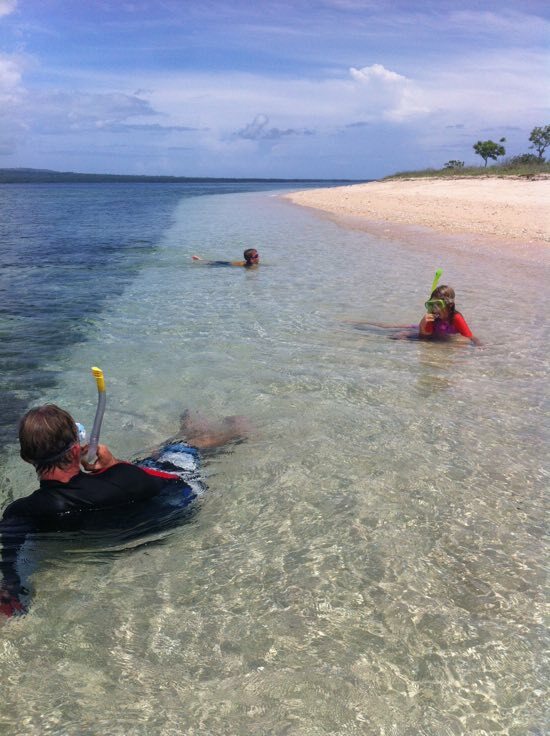 If you have time for only one snorkelling spot, pick Gili Gede, the Gilis or Labuhan Pandan. If you're planning the above all by public transport, you will need longer. We brought our own, but rented wheels is the way to go. If you're planning on hiring a car, contact Oan T: (081) 916 021 443, delombokness@gmail.com who works out of Lembar harbour. He can arrange a car without driver. For motorbike hire, you'll need to go to Senggigi to hire one — they are widely available there (as are cars). Note that travellers are required to have an International Driving Permit to drive or ride legally in Indonesia. There may well be travel insurance implications of driving without one.